Whatever your company may be, you should have an amount of resources on hand to post on social media and on your website. Update your social media with good content not from time to time. Make a good planning, create information and use it to increase number of clients. Continue to improve your service all the time. Otherwise, you can lose customers that you’ve already have. Your competitors are not just sitting around. If you do not share information about new promotions, improving your service or about new products very soon your business may have losses. 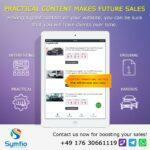 Symfio team is helping dealerships to make their presence in Internet effective.